Lutron is the first company to natively control individual shades using the Google Assistant. 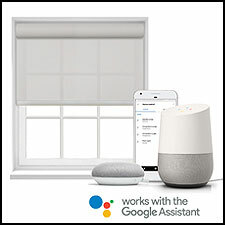 Lutron Electronics, the leader in light and shade control, today announced a new collaboration with Google that allows homeowners to easily control their Lutron Serena, Triathlon, Sivoia QS, and Palladiom shading systems using the Google Assistant, offering greater flexibility and peace of mind. Whether it’s a single shade or an entire home full of them, shades can be operated with a few spoken words – or remotely, through the Lutron app. In addition to controlling shades anywhere in the house with a simple request to the Google Assistant, you can ask the Google Assistant to open or close a particular shade – and even have it stop at a certain height or (for tilt shades) angle. Don’t know what level a shade is at? Just ask: “Hey Google, is the (specific name) shade open?” The Google Assistant will respond and react in real time.